Fiberglass Tank & Pipe Institute welcomes you to our site, especially if you’re searching for fiberglass pipe manufacturers. You’ll want to click over to our Members page to browse our affiliate companies and contact them directly to ask specifics about their services and products. Generally speaking, however, you won’t find anything higher quality than what these companies are offering. Our featured manufacturers specialize in pipe system solutions for oil and gas, water, and industrial sectors. Through their individual customer service and product technologies, they have played a part in the steady demand of fiberglass materials. 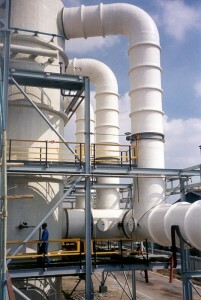 A major part of their product lines are comprised of high-temperature, high-pressure, anti-corrosive, fiberglass pipes. The array of other products includes tanks, fittings, wet wells, manholes, basins, and so forth. The guidelines we administer, in addition to the industry standards, ensure that each manufacturer is competent to offer top-quality, corrosion-resistant solutions for a long list of applications. From chemical processing to power generating, there are several trades that utilize fiberglass. Whether you need a storage tank for oil and gas exploration use or a full order of dampers, these manufacturers will meet your custom needs. Expanding product lines are also common traits of fiberglass manufacturers, in order to meet the evolving demands of customers. Innovative design and product quality are always primary concentrations. If you’re new to the fiberglass alternative, you’ll be glad to know that it is a superior solution compared to the traditional materials. It is eco-friendly, stronger, and bigger than its steel and aluminum counterparts, yet it is lighter, possesses better acoustical features, and is better protected against corrosion. Make one of these affiliate manufacturers your go-to source for fiberglass pipes and you’ll have access to the best of the best. Large or small projects, standard or customized orders, they’ll supply the system you need that will add value to your project.